From Right to Left: Is History Repeating Itself? Dagmar Bazzoni was born in Salzburg, Austria in 1943. Shortly after the end of World War II, she and her family moved to a Red Cross station in Aschaffenburg, Germany, before relocating again to Frankfurt am Main in 1951. Ten years later, she moved to America where she learned English, started a family, and settled in St. Louis, Missouri, where she still lives today. Although she remembers very little of the war itself, Bazzoni’s childhood was defined by its consequences. In this interview, she talks about some of what she does remember, and her fears that Russia’s President Vladimir Putin may be following in the footsteps of Adolf Hitler, the man who led Germany to war in the first place. Rachel Alvord: Do you remember Hitler and his time in power at all? What do you remember from after the war? Dagmar Bazzoni: It’s like learning from what your parents talked about, and people talked about, and when I went to school, people talking about it at school. I was pretty young. I was only about three years old, so I don’t remember anything. I was maybe… four years old, in my first good memories. I do remember it was just really bad after the war, there was nothing available and they had to build Germany back up. There was hardly any food available. We were lucky because my dad worked for the Americans, so he was able to bring food home that was stale, that the Americans didn’t want to eat. Stale doughnuts, bread, things like that. I know, the reason people at first thought Hitler was so great was because he provided a lot of jobs building the Autobahn and so on. And once they realized he just wanted more and more, they started turning against him, but they couldn’t do anything by then. Do you remember what people said about Hitler when you were living in Austria/Germany? Yeah, that he just was going crazy, that he just… just wanted power. He wanted to conquer the whole world. More and more people lost their lives, and they just realized it was not going to be a good world, and that they weren’t going to be able to win that war. And then there was what he did to the Jews… that was just horrible. And you know, a lot of Germans tried to help the Jews, and the French, the French helped them too. But you know back then the French, they really didn’t like us. I don’t know about the British, I think they just wished the Americans had done something sooner. They didn’t talk good about him, I know that. I know my parents didn’t, I know my other relatives didn’t. I know a lot of other people, from what I remember, said if it had been like it was in the beginning it would have been okay, but they said he just wanted more power, more countries, and he didn’t care how many people got killed. They didn’t speak highly of him, let’s put it that way. They really hated him. And I guess that’s why they tried several times to assassinate him. But it didn’t work. Now the people who were higher up, they of course liked him because you know he gave them power. They thought he was God. But the average person did not like him. Do you think that’s how Putin is now? He might even be worse, because he’s more sneaky. I really think that he’s gonna be worse, unless somebody stops him. I don’t think Hitler was as sneaky. He was pretty much out in the open, and he didn’t care if people liked him or not. He did what he wanted to do. But Putin is more sneaky about it, and all of a sudden he surprises people with the things he does. So I really think he’s worse. But how much worse can he be than the things with Hitler? You know? What does Putin do that reminds you of Hitler? He wants the power, he wants to take more land, and more land, and more land. That’s what makes me think, why can’t he just be satisfied with everything being at peace and having his country and letting it go at that? I think he just wants more and more, and the more he can get, the more he’s gonna take. How do they differ? Do they differ? I don’t know, but they’re pretty much the same about having the power and doing what they want to do. It doesn’t matter what other nations think or say, it doesn’t matter. They’re gonna do what they’re gonna do. I think what’s holding him back now is the sanctions that were put on them, but I doubt that will hold up. I think as long as we get all those other nations together on our side, he’s gonna be a little more cautious. But once there’s a few more countries he can get away from us, he’s going to be like a loose canon. Hitler did a lot of good things for Germany after WWI, and public opinion of him in 1925 or 1935 was obviously very different from public opinion of him in 1945. Do you think it’s a similar situation in Russia, or do you think Putin’s regime is entirely negative? I’m not sure about that. I was very surprised, but I think a lot of people were surprised… well, he must have put a lot of people to work with the Olympics and so on, but now I dunno what’s happening. I dunno. I don’t really know how to answer that, because… I don’t know. I think he’s greedy, and he’ll do anything he thinks he can get away with. What surprised me, he waited until the Olympics were just about over, and he started doing this with the Ukraine. It was just planned, it was planned. And the way he went about it was very sneaky, and of course it was wrong. But I dunno how to answer that question. I dunno, he’s just unpredictable, and I don’t trust him. Do you think Putin has any goals that expand outside of Russia? Do you agree with the claim that he wants to reconstruct the Soviet Union, for example? 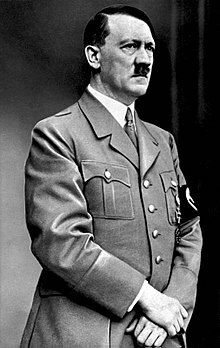 Hitler used the excuse of Lebensraum and claimed to be working for the sake of German people and so on. Russia obviously doesn’t have the same space problems that Germany did/does, so why do you think that about Putin? What excuse do you think he has? It’s greed, number one. He probably can come up with any excuse he wants to, of course, but greed is number one. Is there anything that can be done to prevent Putin from going to the same lengths that Hitler did? Yeah, our nations sticking together and putting sanctions on him. Now what I really think, I better not say, but… you can put two and two together on that one. Convince him… I think he’s so far gone, he’ll do anything he can get away with. I don’t think there’s any real way to stop him. The only way of stopping him is putting our nations together and putting sanctions against him, unless we go to war, and nobody wants to do that. Do you know if other people see Putin the same way you do, or is this just a personal correlation you’ve found? Oh yeah, people I’ve talked to in my German group*, and pretty much all fourteen of us agree on that. It’s just… it’s not good, not good. If we can strip him of his power, that would be a good thing, but how do we go about it? We really don’t know the full story, what’s going on over there. Is he killing people, is he jailing people… who knows? We only hear really what he wants us to hear. We don’t know exactly what’s going on. What he does to people over there… I’m surprised that so many people in the Ukraine signed up to be part of Russia again, that they were so willing to be part of Russia again. There’s gotta be something behind it, some other force, I dunno. * Bazzoni routinely meets and spends afternoons with a group of friends made up of other German-American women to chat, catch up with each other, and apparently, gossip about international politics. I wish that we could get the nations together and strip him of his power, if that’s possible. He won’t give up his power easily, I know that, but it’d be a solution. I dunno, I just don’t trust him, he’s just too sneaky. And he wants power, he definitely wants power. And he did say something – or I read something in the news about that – that if he wanted to he could bomb North America. So that means he has something there, and I just thought ‘oh, where did that come from, something’s not right there.’ But he knows that if he does too much, there’ll be sanctions and Russia will suffer. If that’s what’s holding him back, I dunno, but to make statements like that? He’s just got something planned, and that’s scary. Bazzoni and her friends are hardly the first people to draw comparisons between the two political leaders. German Finance Minister Wolfgang Schäuble drew a direct line between Putin’s invasion of Crimea and the Nazi seizure of the Sudetenland in 1938. Though his statements made news everywhere from Germany itself to (perhaps more significantly) the state of Israel, he himself made the connection almost a month after Hillary Clinton did, highlighting the fact that these sentiments are not new. It goes without saying that calling Putin the next Hitler is a strong accusation, but the parallels are clearly there for people to find. So what do you think? Do you agree that history is in danger of repeating itself, or do you think Putin’s ambitions will follow a different road? This entry was posted in German, Politics, Russia and tagged Adolf Hitler, German History, interview, Vladimir Putin. I’m not sure what to think about Putin yet, but this interview is very insightful; we can always take some time to learn from those who’ve experienced the history we read about. You raised some pretty good thought-provoking questions and Ms. Bazzoni gave some great answers.